Transport minister Stephen Ladyman has said he is determined to find a solution to Operation Stack in Kent. He told the Commons the system, in which lorries unable to cross the Channel are parked on the M20, had been implemented five times since December. "It has disrupted journeys for many people and I have been caught up in it myself, so I do understand," he said. 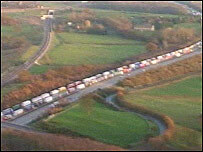 Tory MP for Ashford, Damian Green, said the Department for Transport needed to take a leading role to end the problem. "Closing the motorway should be absolutely the last resort - but in this bizarre policy it is the first resort," he said. Mr Green said he had called the adjournment debate to draw attention to the disruption caused in Kent by Operation Stack. "It is a growing problem because the amount of lorries using Dover is increasing by more than 15% every year and the problem is getting worse, " he said. Mr Ladyman, MP for South Thanet, said that in the short term improved signage and warning signals would so speed up road closures. In the medium term, the Highways Agency was looking at using a quick moveable barrier to allow two-way traffic on one lane of the motorway. Four possible sites are also being discussed which might become lorry parks in the longer term. "I understand that Kent County Council are urgently looking for off-road sites and we will receive any ideas they produce with interest," he said. "But a site has to be acquired and made accessible for heavy trucks in very difficult weather conditions. "These are not going to be cheap solutions." And he added: "Tricky planning issues will have to be resolved if a permanent solution off-road solution to Operation Stack is to be found."